Steve Taylor is Will Kemp – celebrity comedian and superstar of the Elizabethan stage. Kemp has created many of Shakespeare's comic roles. But there is something rotten in the state of the relationship between writer and performer. Kemp craves opportunities for his comedy dog and clowning routines; Shakespeare craves respect for his writing and objects to Kemp's improvisation. So they part – and Kemp's publicity stunt of Morris dancing from London to Norwich begins. 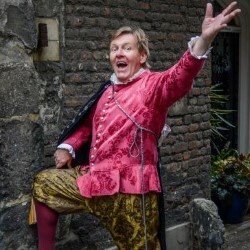 Fans of Upstart Crow or Shakespeare in Love will enjoy cheering the maverick Kemp on his way.